Do you want to stand on top of the tallest mountain in the continental United States? At 14,497 feet (4418,69 m) Mt. Whitney is one of the most picturesque places in the Eastern Sierra. Located east of Lone Pine, Mt. 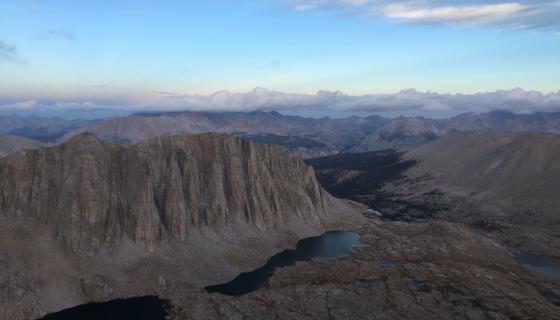 Whitney is most easily accessed by the Whitney Portal 13 miles east of town, with a beginning elevation of 8,365 feet. While accessible without extensive training or technical equipment, summiting Mt. Whitney is difficult and still requires planning, permits, practice and lots of preparation. While the main trail can be hiked in 1 day, most visitors complete it in 2-3 days. Bears, Marmots, Mice, Squirrels, Quail, Robins, Deer, and Blue Jays are all found in the Whitney area. Remember, do not feed any animals and do not leave any food unattended. You will need to take precautions for bears and marmots. Marmots will chew through your tent to get to anything that smells interesting. Tip: leave the door open so they don’t make their own entrance. Food and even empty food containers (such as ice chests) must be stowed in bear proof boxes at the Whitney Portal, not in your car! You can, and will be, cited if you fail to do so even if the bear has already ripped your car a near sunroof. Bear canisters must be utilized by hikers on the trails unless they have a one-day permit only and even then, consider using one. Remember, a fed bear is a dead bear. Help protect wildlife by properly taking care of your food and belongings. Permits are required year round for entry into the Mt. Whitney Zone for both day use and overnight use. Your permit must be visible as you hike anywhere in the Mt. Whitney Zone. Tip: Use the wire provided with the permit to string it around your backpack, on the top, where it can be seen at all times while hiking. A quota system is in effect between May 1st and November 1st each year. The Mt. Whitney Zone limits day use to 100 visitors per day, 60 visitors a day for overnight use, and 25 per day for Trail Crest exits while these restrictions and quotas are in effect. Mt. Whitney Lottery, Wilderness Permit Office - Inyo National Forest. 351 Pacu Lane, Suite 200, Bishop, CA 93514. Phone #&apos;s: Wilderness Information Line- (760) 873-2485 and Reservation Line- (760) 873-2483. Enter the lottery to reserve a backpacking trip on the Mt. Whitney trail, or a day hike in the Mt. Whitney Zone. Applications are accepted from February 1stthrough March 15th. Any additional space left over after those dates will go on sale April 1st at 10:00am. For more information regarding the Mt. Whitney Lottery, please visit the Passes and Permits page for Mt. Whitney Reservations. Frequently asked questions and answers to those questions can be found here. During the acceptance period, you can decline a date it you no longer want it.Changes to group size can be made online after April 1st, if space is available. Corrections to itineraries or exit locations can be done when the permit is issued. You cannot resell or transfer your reservation to another group or individual. Yes. You will be fined and asked to leave if you enter into the Mt. Whitney Zone without a permit. Rangers patrol regularly to make sure that everyone is carrying a permit that allows them to be in that area, as well as for safety and visitor assistance. Make sure you come prepared with a permit, your Hiking Essentials, and of course, a camera. Many access this historic mountain from the East side, but did you know that you can also start or end your trip on the West side of the Sierra? Starting your trip out of Sequoia & Kings Canyon National Park may provide you with a unique and different experience than most others. These less commonly used routes will get you to Mt. Whitney, but require a longer hike and trip to reach the summit. The great part? 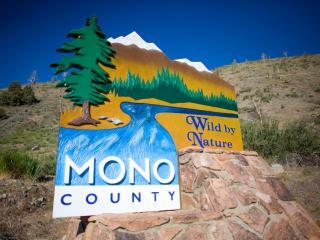 They tend to leave from less heavily-used trailheads and if you are looking for a more secluded, relaxing trip up Mt. Whitney, this is the way to go. The High Sierra Trail leaves from Giant Forest on the west side of Sequoia National Park and takes a minimum of 6 days (shuttle trip) or 10 days (round trip) to complete. On the west side, you can find books, maps and information on hiking Mt. Whitney at the Sequoia Natural History Association&apos;s bookstore and elsewhere in the Sequoia and Kings Canyon areas. Remember though, permits are required for all overnight travel in Sequoia and Kings Canyon National Parks, as well as a separate permit for entering into the Whitney Zone. For more information on West side approaches to Mount Whitney, visit the Sequoia and Kings Canyon National Park Service website. Are you one of those people who likes a little bit more adventure and a whole lot more adrenaline? Then this section is for you folks. While people typically like to hike Mt. Whitney, the link below provides climbers with all the tools and information necessary to find the right route, make sure conditions are excellent, and how to obtain the correct permit. You can find all of this important information, on the Summit Post Mt. Whitney Page.